you spy a small dead tree, covered with mushrooms and some moss. and a handful of leaves it becomes a charming fairy house. 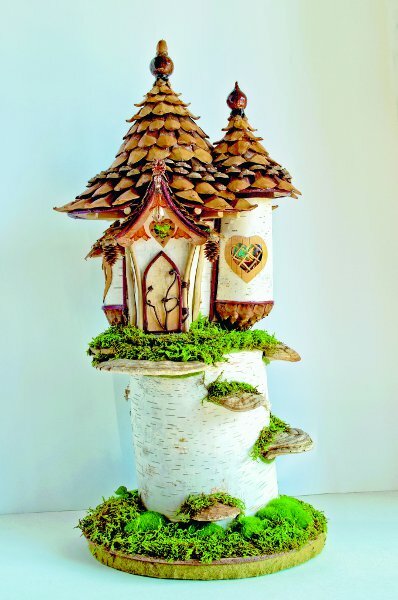 Her primary focus, though, is on enchanting dwellings, beautifully detailed with towers and turrets, bay windows and porches. 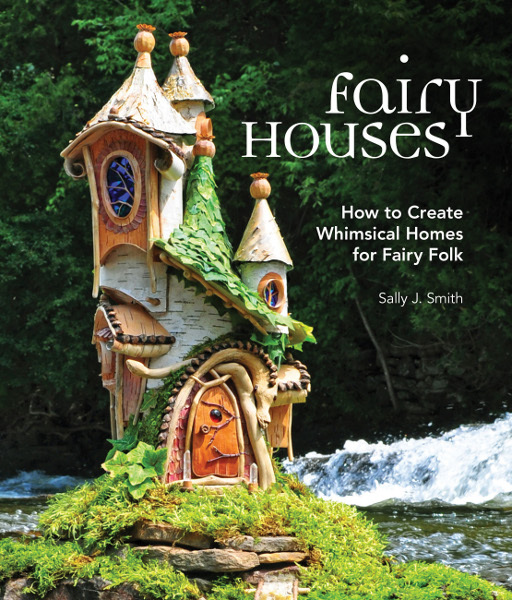 In thorough detail she provides a wonderfully illustrated fairy house builder's bible and how-to book. Some are intended for dwellings placed outdoors, in the garden or natural landscape. Others, more delicate, are studio pieces that might invite the wee folk to come share your home. 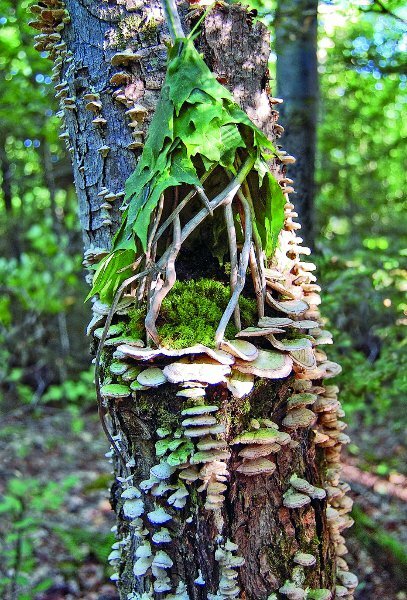 After all, a fairy house shows the fae that you believe in them. It also shows that you are making efforts to extend your hospitality. It should be constructed of mostly natural materials. Ready to start? Not quite so fast as leaping forth into the woods picking up twigs and stuff. First, you need a tool kit. The two page spread (outdoor kit / indoor kit) in "Fairy Houses" includes lots of stuff which you probably already have, with some duplicated items in the two kits. 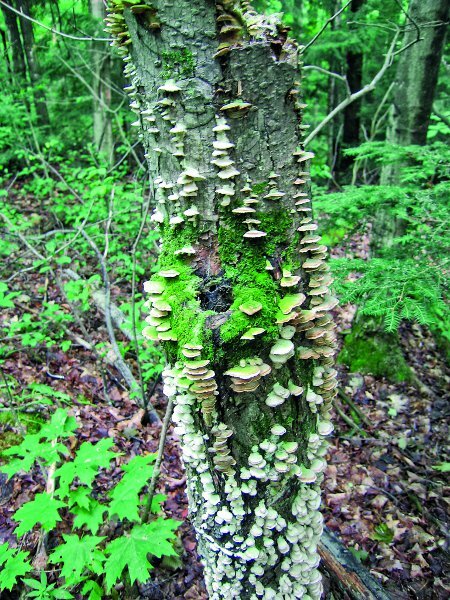 Next, building materials: twigs, bark, fungi, and more, also illustrated and described. Exploring further afield she includes bits and baubles for finishing touches - silk ribbon, glass and acrylic beads, sequin trim, beautiful papers, and much more. Forget any idea that these are instant gratification projects. Windows, for example, could have a mullion, or an infill of a leaf decayed to a fine tracery of veins. One example she shows has freshly harvested hazel leaf draperies. But taking your time is a good thing, offering an opportunity to revise your design as you go along, perhaps finding interesting (and suitable) new material on a stroll through the forest. Always collect material when and where you find it. If not a current project, for the next / another one. 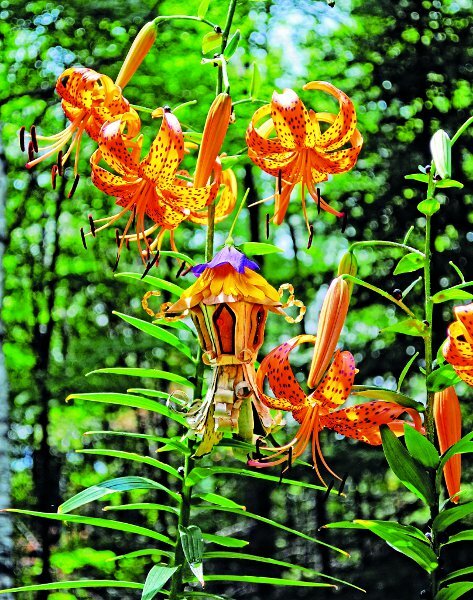 with sunflower and platycodon roof, nestled among tiger lilies. Consider an option for nighttime enhancement (I nearly wrote that that as "enchantment," which, now that I think of it, is also true!) LED battery operated tea lights are relatively simple. Battery powered micro LED string lights take "a fair degree of patience and care" but add a mystical, magical effect. 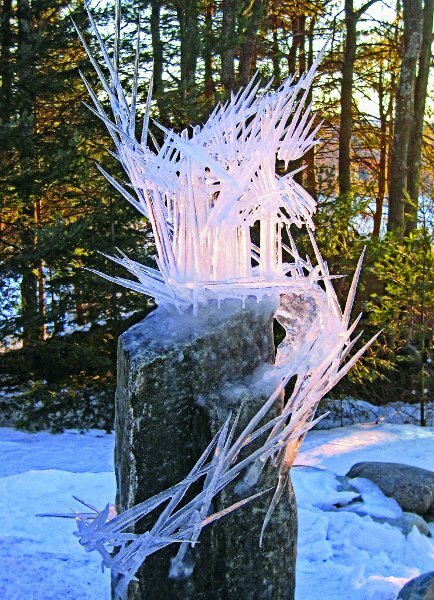 a winter pop-up structure (do fairies go ice skating?) - Ice Queen's Palace. Does this awaken your inner child, love of nature, meditative walks in the forest? 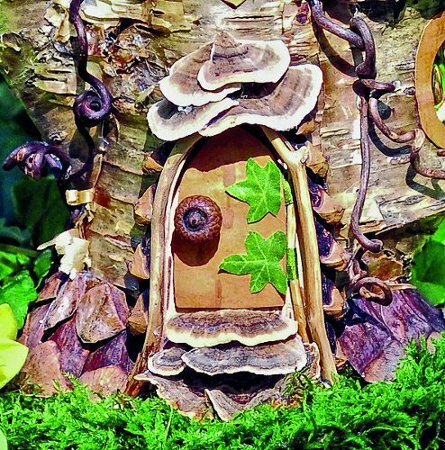 Then come, open the door and walk into the magical world of building fairy house. Published by Cool Springs Press, Minneapolis, Minnesota, 2017.